"There are more Hungry Howie's stores in Florida that gross a million dollars or more per year than anywhere else, and radio advertising is one of two mediums we rely on to get people into the stores." 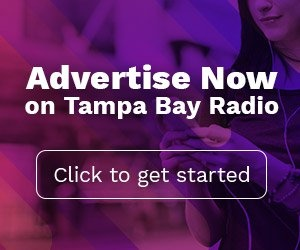 The primary benefit advertising on Tampa Radio offers to Hungry Howie's marketing effort is repetition. "Radio provides us the affordable frequency we need to hit hungry consumers over the head enough times for our message to sink in," says Mr. Devine. "We want to be top of people's mind when they are driving home from work and don't feel like cooking." 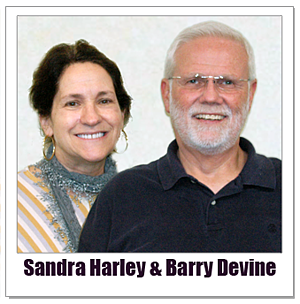 Market research supports Mr. Devine's choice of radio to deliver his advertising in Tampa. 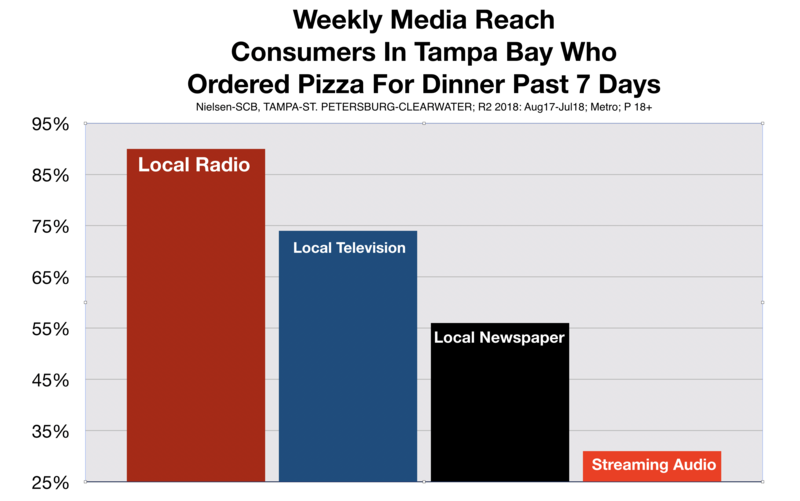 According to Nielsen, 90% of consumers who will order a Pizza for dinner tune-in to a Tampa radio station each week. This is significantly more than watch local TV, read local newspapers, or log-on to streaming media services like Pandora or Spotify. "The best target of our advertising, of course, are people who already know and have visited Hungry Howie's stores," says Mr. Devine It is easier to convince current customers to come in for dinner tonight than people who have never tried us." 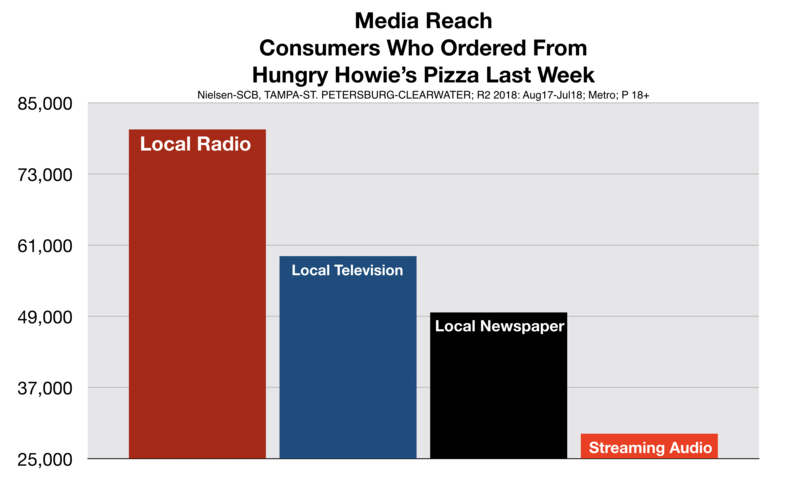 Nielsen research shows, again, that advertising on Tampa radio reaches a higher percentage of Hungry Howie's current customers than all other local media. In addition to investing heavily in advertising on Tampa Bay radio, Hungry Howie's other primary marketing medium is direct mail. "We like Tampa radio," says Mr. Devine, "because none of the other big chains use it. Not Domino's. Not Little Caesars. Not Papa John's. We like to stand alone. We don't find it productive to go head-to-head with our competitors. That's why we also invest in direct mail. None of the competition is there either." "The other guys have a strong presence on Tampa Bay television and online. We don't have the funds to compete there. After all, they each have thousands of stores." "What I really like, though, is advertising on Tampa radio and direct mail in the Tampa Bay area complement each other perfectly. Whatever offers we have in our mail pieces we also include in our radio commercials," says Mr. Devine. "It is common for customers to tell our store managers that they heard our ad on the radio that afternoon and then there was a coupon waiting in their mailbox when they arrived home." "That's the double-whammy," says Mr. Devine. "That's exactly how we want radio advertising and direct mail to work together." "Look, we've tried TV and cable advertising, but it was too expensive to generate the frequency we need," says Mr. Devine, "and nobody really reads the newspaper anymore. And we don't use streaming media like Pandora or Spotify because they just don't have the hometown feel like Tampa radio does. 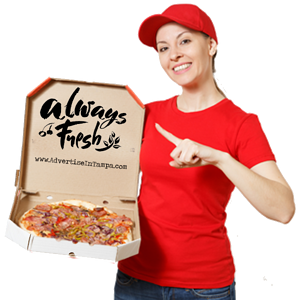 We want our customers to think of us as their local pizza joint." Ms. Harley agrees. "Everything we do needs to build frequency of message for Hungry Howie's. My success equation for media buying is simple," she says. "What you say, times the number of times you say it." Mr. Devine adds, "The first couple of times someone hears the Hungry Howie's message on Tampa radio, it's like planting seeds. Adding frequency is like watering the seeds to make them grow. We can only buy that type of frequency on radio."